The Canon Pixma G4500 is an all-in-one printer that offers the ability to print, scan, copy and fax all from one machine. The size allows it to be placed in a small space without it being intrusive and the wireless ability allows it to be used in a versatile way without having to sort out and untangle cables. This Canon offers good quality prints at a high yield with the refillable ink tanks capable of delivering 7,000 colour pages, which makes for a cost-effective piece of equipment. One way in which the Canon Pixma G4500 is a convenient option for a home office or small business is the compact design. The configuration of the printer puts a document feeder above the flatbed scanner to make it easy to use. This is also the case for the full dot LCD, which clearly displays the function. The auto feed paper cassette can hold 100 sheets, this means that it does not need continual refilling. The controls are conveniently placed, making the printer easy to operate and user friendly. 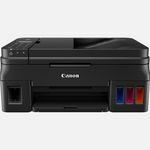 The Canon G4500 is inexpensive to run with the refillable tanks being easy to replenish and providing for both colour and black inks; the page yield possible is 7,000 and 6,000 respectively. The USB 2.0 connection that the printer can boast complements the Wi-Fi connectivity to give the user options as to how they want to print, such as from a mobile device with the use of an app. It takes 11 minutes for the Canon Pixma G4500 to transfer into standby mode, which may not be fast enough for some users. The refillable ink tanks limit the colours that can be achieved when printing. It is only compatible with Windows.